Beatles Vinyl Records, Butcher Covers, Memorabila, Autographs - Beatles4me.com - Shop Rare Collectibles Sales of The Fab 4!!! Beatles vinyl, Beatles mono, Beatles vinyl mono, Beatles records, Beatles mono records, Beatles vinyl records, Beatles Albums, Beatle Memorabilia, Beatles memorabilia Collectibles, Rare Beatles Records, Import Beatles Records, Collectible Beatles Records, Old Beatles Albums, Rare Beatles Albums, Vintage Beatles Albums, USA Beatles Albums, Import Beatles Albums, Authentic Beatles Acetates, Still Sealed Beatles Albums, High Quality Beatles Albums, Anthology Record Records Merchandise Singles John Lennon Imagine Autographs Paul McCartney Yesterday Today George Harrison Ringo Starr Yellow Submarine Fab Four Records 4 Sale! "Your #1 Beatles Source of Rare Beatles Vinyl Records & Beatles Memorabilia since 1977"
All items offered here on our are Guaranteed Authentic! Shop Beatles here on our Online Beatles Store with 100% CONFIDENCE!!! include our LIFETIME GUARANTEE Letter Of Authenticity (LOA/COA)!!! Beatles items for you or that special person in your life. & Beatles Autographs available here! "CLICK HERE" to View Our ONLINE BEATLES Store Catalog!!! To receive our "Extensive" Beatles Catalog (Hardcopy), featuring 100's of Original Beatles records, albums, 45's, LP's EP's memorabilia collectible items and autographs yet to be posted here, send $10.00 to our address provided at the bottom of this page...OR ""Click here"" to view our "FREE Beatles Records, Memorabilia, Autographs & Collectibles"!!! This list of 800+ Beatles items on this link represents only 1/25th of our vast inventory! Yesterday And Today Butcher Covers Block Beatles Albums Beatle Memorabilia Collectibles Anthology Records Merchandise Record Yellow Submarine Singles John Lennon Imagine Autographs Paul McCartney George Harrison Ringo Starr Fab Four Records 4 Sale! Beatles Records Albums 45's LP's Record Yesterday And Today Butcher Covers Block Beatles Albums Beatle Memorabilia Collectibles Anthology Records Acetates Merchandise Record Yellow Submarine Singles John Lennon Imagine Autographs Paul McCartney George Harrison Ringo Starr Fab Four Records 4 Sale! 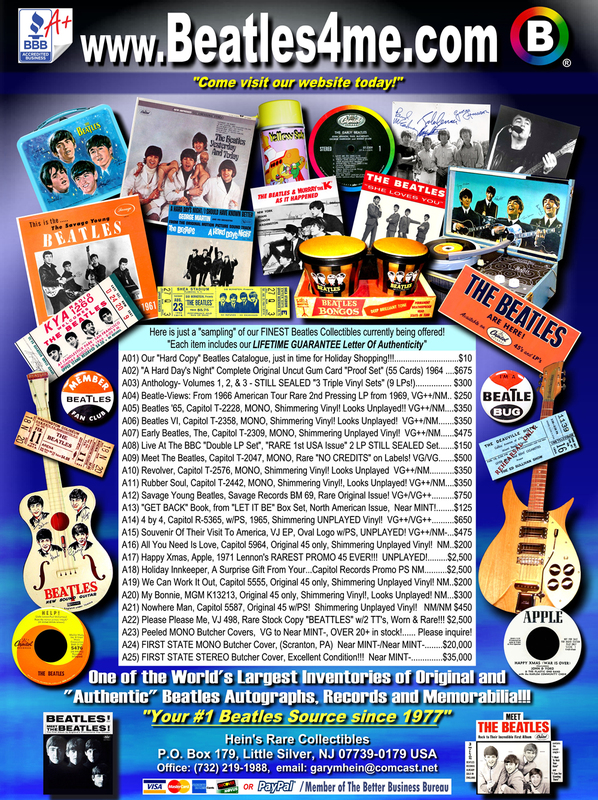 Undoubtedly, we own "THE LARGEST RARE BEATLES INVENTORY" on the East Coast! and OVER 10,000+ Beatles Memorabilia Collectible items are for sale!!! Beatles Albums Beatle Memorabilia Collectibles Anthology Records Merchandise Record Yellow Submarine Singles John Lennon Imagine Autographs Paul McCartney Yesterday George Harrison Ringo Starr Fab Four Records 4 Sale! "One of the Top Leading Authorities on Beatles Rare Records & Memorabilia"
and Collectibles of The Fab Four"
"PROFOUND Updates/Contributions were made by myself in all of Perry Cox's Beatles Price Guides"
Bruce Spizer's Beatles Vee Jay, Capitol & Apple Record Books"
My reputation of "40+ years" worldwide in this industry is impeccable. "Please come back & visit us for our NEXT Scheduled Update!" Your #1 Rare Beatles Website!!!" Albums Beatles Records 45's LP's Record Yesterday And Today Butcher Covers Block Beatle Albums Beatle Memorabilia Collectibles Anthology Records Merchandise Record John Lennon Imagine Autographs Paul McCartney George Harrison Ringo Starr Yellow Submarine Singles Fab Four Records 4 Sale! "Your #1 Beatles Source of Records & Memorabilia since 1977"
GOLDMINE Magazine "Customer Service Award" Winner! All Artwork, Concepts, Content, Design, Beatles Memorabilia & Record Photos provided on our website Copyright © 2004-2019 (V190408) Beatles4me.comTM All Rights Reserved. Beatles Albums Beatle Memorabilia Collectibles Anthology Beatles Records, Merchandise Record Yellow Submarine Singles John Lennon Imagine Autographs Paul McCartney Yesterday George Harrison Ringo Starr Fab Four Records 4 Sale! Beatles collectibles, Beatles Records, memorabilia, toys, Beatles Albums, singles and more online on our website. We offer a the absolute best collection of quality original Beatles Records, Memorabilia and Autographs, guaranteed original and authentic!! !